The regions in Ireland where most people speak Gaelic as their first language are marked in green. 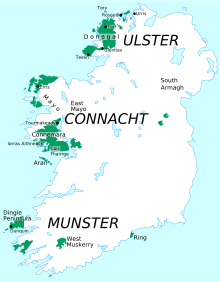 Gaeltacht areas are regions where many or most of the people speak the Irish language. They are in the Republic of Ireland. The largest Gaeltacht areas are in the counties of Kerry, Cork, Galway, Mayo, Donegal, Waterford and Meath. At the time of the 2006 census of the Republic of Ireland, the population of the Gaeltacht was 91,862, about 2.1% of the state's 4,239,848 people. The main concentrations of Irish speakers are in the western counties of Donegal, Mayo, Galway, Kerry, and Cork. But in Gaeltacht electoral districts the percentage of Irish speakers is much higher. ↑ "Report of the Gaeltacht Commission" (PDF). 2002. Retrieved 2012-08-21. This page was last changed on 27 January 2017, at 16:00.